Picture this: It’s a hot, sweaty summer day and you’ve lined up on the plate, ready to send the ball over the fence and into the stands with a massive drive. But as soon as you swing, the bat slips out your hand and goes flying. Over time, we have seen more and more players in the MLB using baseball bat grip tape. They have become an extremely popular accessory used by baseball and softball players alike. Bat grips are not only a quick way to deck out your bat in cool new colors and patterns, but they’re also a durable way to increase comfort, decrease sting in the hands and improve grip on any bat, in any kind of weather. On hot days, bat tape provides excellent tack, and on rainy or cold days, the grips hold up and work well without being any less tacky or reducing sting any less. Unlike traditional sports tape, the polymer which is water-resistant holds up. Best Bat Grip Tape – Which Is It? At one end of the spectrum, we have polymer bat grip tape from seasoned companies such as Lizard Skin, Vulcan, Easton, Franklin, Rawlings. 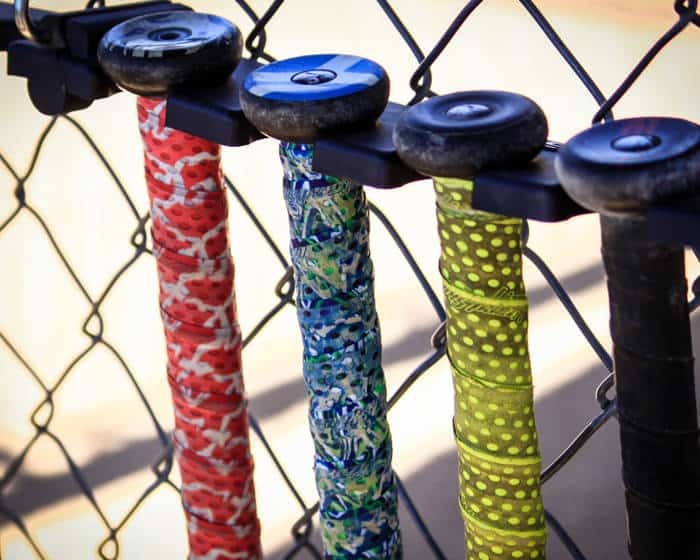 These are the colorful grips with patterns and bright colors you’ll see out on the field. They are more tacky/sticky and allow use even without batting gloves. On the other end of the spectrum, we have athletic tape and hockey tape; such as what would be used to wrap athletes ankles during training. They come in a range of color options too, like the lizard grips. They are the cheaper, less high-quality option when you want to keep your costs low. Lizard skin has about 6 years in the game as of 2018. The popularity of their grips has skyrocketed in baseball & softball. Lizard skins initially started by making competitive bike handlebar grips. In 2012, confident that the transition into baseball and softball would be an easy one owing to their similarities and their common purpose – to provide comfortable, long-lasting grip for athletes – the Utah-based company took their 18-year experience and applied it to baseball bats. And true to it, their baseball grips ticked every box. They are durable, lasted despite the weather conditions, and were comfortable and provided added tack. Lizard Skin is made from Durasoft Polymer (DSP) and offers countless colors to choose from including options such as digital camo, colors of the American flag, and solid colors. These bat grips are a great option to make your bat stand out. Lizard Skin bat tape comes in three different thickness sizes to fit a range of needs; 1.8mm in thickness, 1.1mm, and 0.5mm. Today, Lizard Skin batting grips are a top choice for lots of players across all levels, including top Big League hitters such as Russell Martin (Toronto Blue Jays), Hunter Pence (Giants), David Ortiz (Red Sox). That’s probably the best endorsement for Lizard Skins bat tape you’ll find. While Vulcan bat grips may not be as popular as Lizard Skin grips are, but they are just as good. 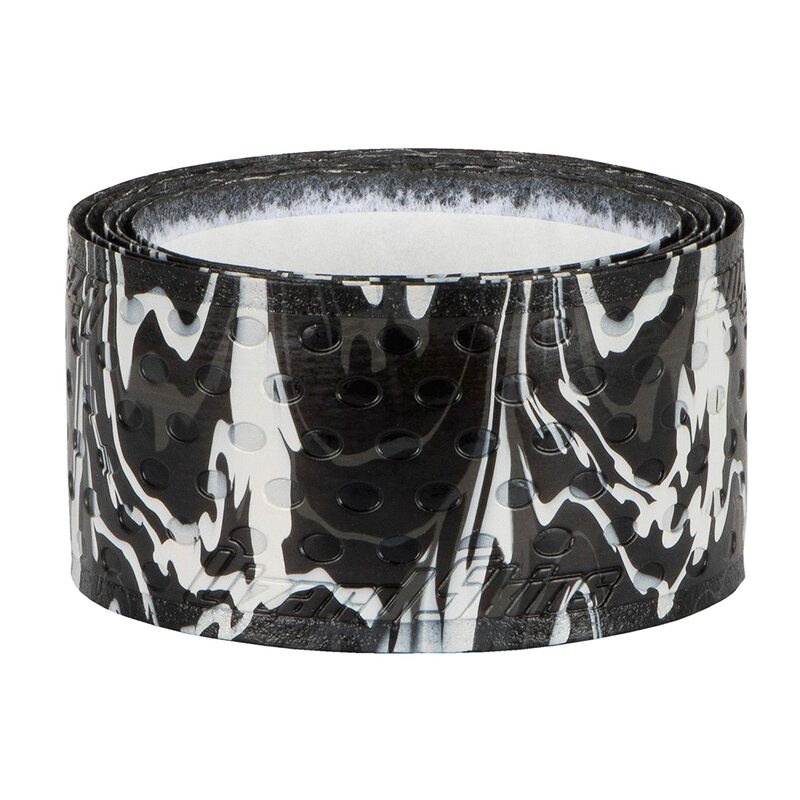 Similarly, Vulcan bat tape also comes in 3 sizes, namely; 0.5mm, 1.0mm, and 1.75mm thick. These bat grips are made out of a polymer blend. They also have a wide variety of about 45 color options and patterns. That’s A LOT of options! Of these patterns, we have a USA series, a Splatter series (Looks as though a paint was splattered across a second paint color), ASP Series (Digital Camo) and less popular choices such as solid colors and the Fade Series where one color fades into another. Having used both options on our bats, we believe Lizard Skin grips are the best bat grip tape of the two. For repeated use and abuse over time, Lizard Skin grips win hands down. We have bats that have used the same grips for years and are still holding up to this day. With Vulcan grips, on the other hand, we have had to change some after only a season of use. However, Vulcan grips perform better in less ideal weather conditions like rainy or humid days. If you don’t mind replacing them a lot more frequently than you would with Lizard Grips in exchange for better performance in wet weather, then go for it! 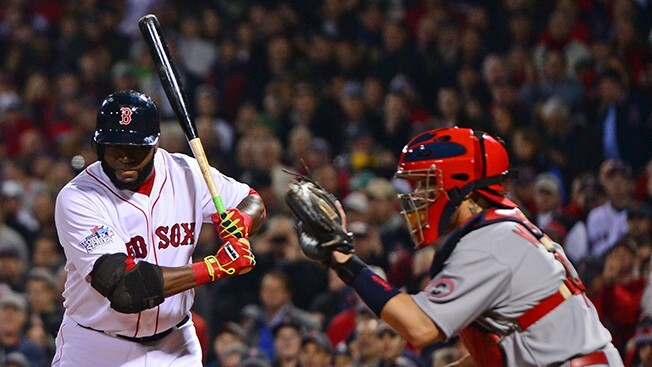 Easton is an extremely popular brand in the baseball world. They make some of the best baseball bats – from youth bats, BBCOR bats and more. When it comes to innovation, design, and tech, their bats are the cream of the crop. Therefore, it comes as no surprise to hear that they also make one of the best bat grips on the market today. The VRS grip employs multiple layers of dual-density polyurethane. This cushions the grip and makes it comfortable, and the multiple layers help with eliminating bat sting. 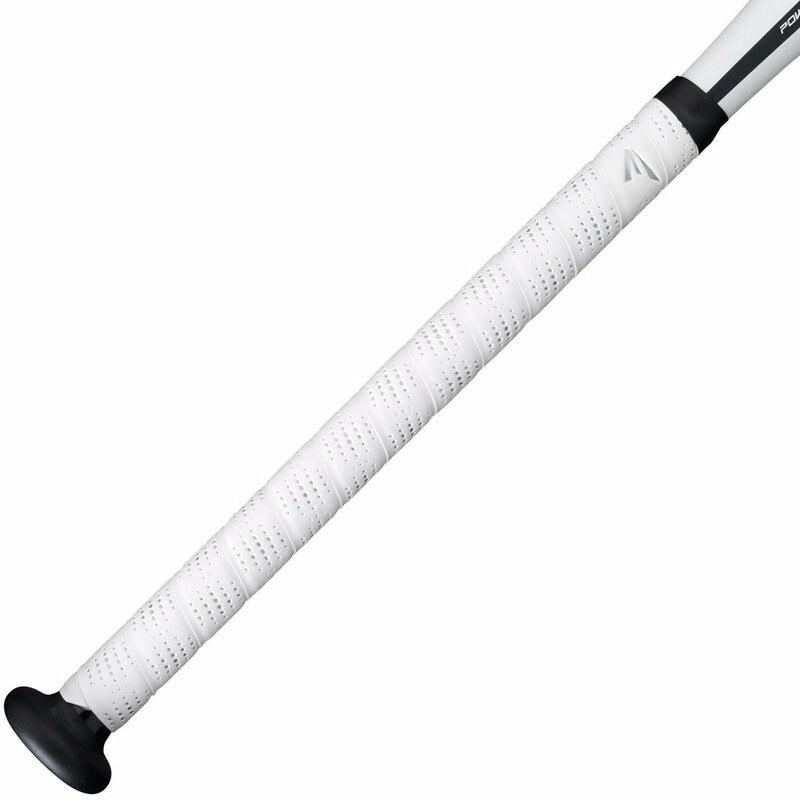 Additionally, the VRS grip has a diamond groove pattern for better grip, especially in the rain. Unfortunately, the Easton VRS grip has few color options (only available in black or red). Rawlings is another major player in the baseball bat space, making fantastic bats such as the Rawlings Quatro. 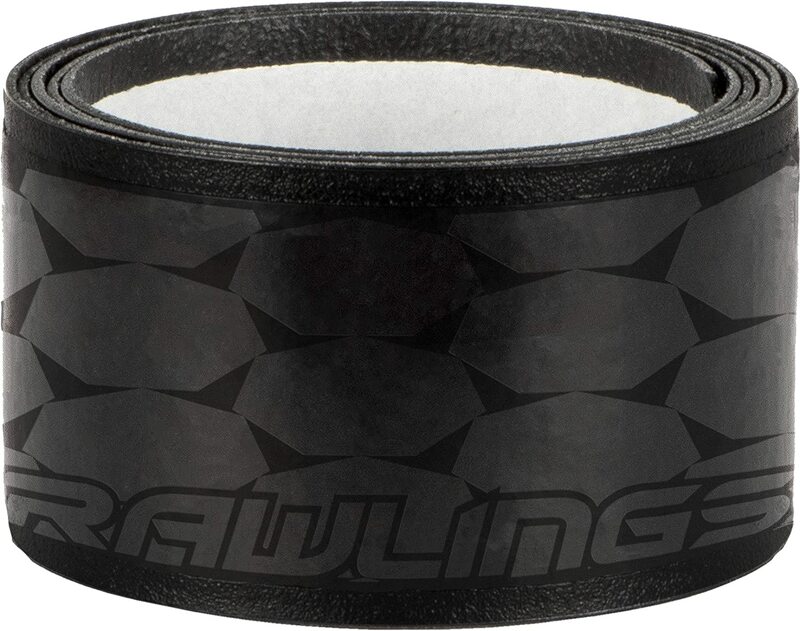 The Rawlings Bat Tape is a great, cheap, all-purpose tape. It comes with the benefits that the other bat grips on this list offer. They dampen sting, are water resistant, provide ample grip and comfort. The reason we’ve chosen Rawlings Bat Tape is its brand, Rawlings. Additionally, the grip comes in multiple colors, including a camo version! As metal bats grew in popularity, so did bat tape. Bat wraps have primarily been used on baseball bats to improve grip, but recently they have been specially engineered to do a lot more. Modern bat wraps also reduce vibration, provides additional comfort and decks out your bat in cool colors and patterns. Bat wraps do well to dampen sting, which can be common in bats such as one-piece bats. These bat wraps are less like tape and are instead made using rubbery cushiony materials. They are often thicker to counteract the vibrations and have tack to improve the hitter’s grip. The best bat grip tapes hold up and work just as well in cold, rainy weather. In the rain, these wraps are water resistant and won’t peel off like traditional athletic tape would. Additionally, on hot days, bat wraps wick sweat away so that the bat is still as comfortable and grippy as before. 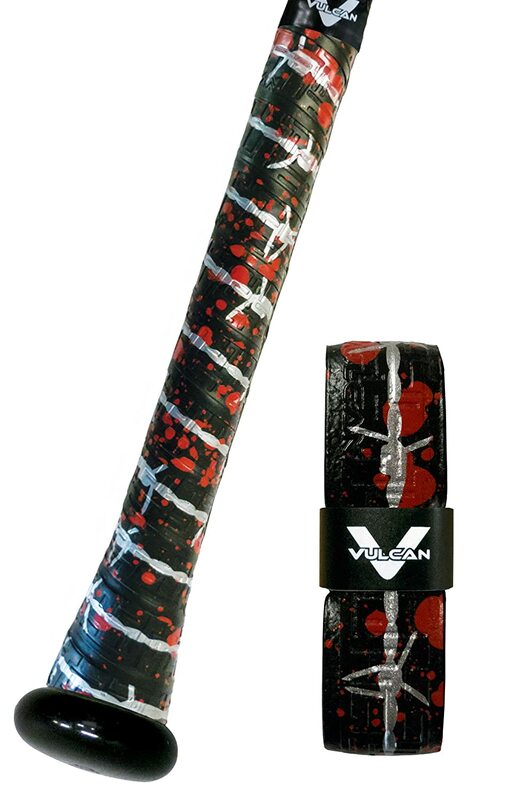 Lizard Skin grips, Vulcan grips both offer 3 choices in terms of sizing. While they are sized differently, the sizes are close enough to be grouped together. 0.5mm – This thin grip is preferred by pros that use wood bats. The thin grip gives a more authentic/tactile feel to the bat but provides exceptional grip as is expected, without having to resort to pine tar. Pros such as Bo Jackson and Ken Griffey Jr have been known to sport this grip. Additionally, the 0.5mm is also used for softball bats since sting protection isn’t really needed by softball players as they often prefer their handles as thin as possible. 1.1mm – The middle size grip is the most popular, and offers a nice middle ground. This is a standard grip that is used for new bats coming off the factory line. This thickness is preferred by players who don’t want too big of a cushion but still aren’t ready to use the much thinner 0.5mm. 1.8mm – Widely used on youth bats, this grip offers the most cushion of the bunch, and is preferred by young players with smaller hands, and most high school players. For little league players looking for the best protection against sting, the 1.8mm is a perfect choice as it cushions against sting on mishits best. These grips provide some reduction in sting & vibration and are perfect for kids who are just about ready to change from alloy/composite bats to wood bats. At the end of the day though, choosing the best baseball bat grip tape comes down to preference, and certain variables such as their thickness, color options, and how much you’re willing to spend. Some hitters prefer traditional athletic or hockey tape for its feel. With these wraps, you simply add layers until you get to your preferred comfort level. These still won’t come close to the sting reduction sting reduction provided by polymer grips, but that’s exactly why players prefer it. Bat wraps don’t differ too much in terms of the benefits they offer. However, top-tier wraps such as Lizard Skins and Vulcan have quickly gained a huge following because of all the colors, patterns and designs they offer. How do we get our bat tape reviewed?